Bring the party to your dining room or living room with the Avenue Greene Briley Wine Cabinet. This Wine Cabinet features multiple different types of storage with its 12 bottle cubbies, 1 drawer and 4 shelves. You can keep anything from your favorite wines, wine glasses and bottle openers in this Wine Cabinet for a one-stop-shop to a good time. The 4 shelves (2 adjustable) are behind louvered doors to keep your items out of sight but still right where you need them. The single drawer gives the illusion of 2 drawers with its double knobs and grooved drawer front but offers a deeper space to keep items. 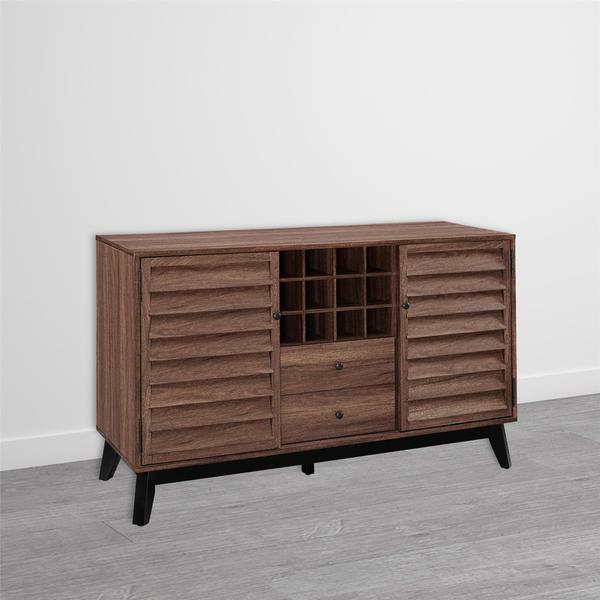 The mid-century look of this Wine Cabinet is made with laminated particleboard, MDF, wood veneer and solid wood for a strong build that will last for years and is finished in your choice of a warm brown walnut color or weathered grey oak color. The cabinet is recommended to be assembled by 2 adults. After fully assembled it measures to be 29.75"H x 47.25"W x 19"D. Complete your living room with other Briley collection items - each sold separately. The sturdy structure of the laminated particleboard, MDF, wood veneer and solid wood looks great finished in the warm brown walnut or weathered grey oak color (each sold separately). Complete your collection with other items in the Briley series. Dimensions 19.0 In. X 47.25 In. X 29.75 In. "What type of wood is this made of?"